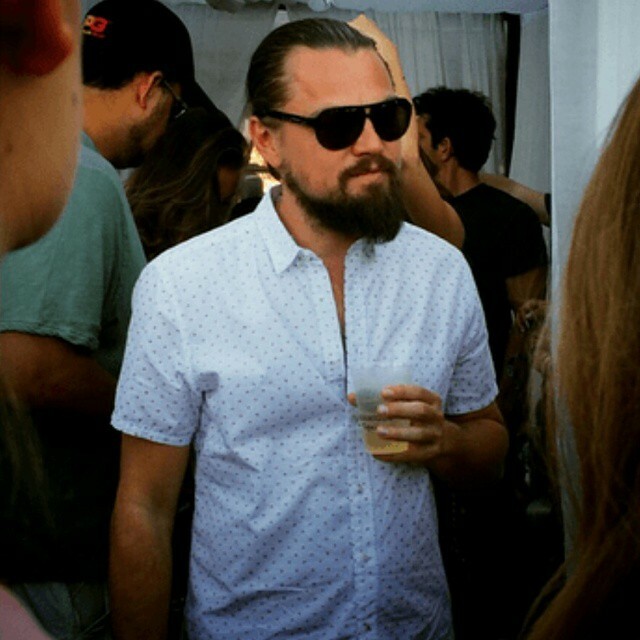 Feast your eyes on what soon could become a new meme: Leo Dicaprio’s Coachella 2015 dance moves. The actor was spotted at the Neon Carnival this past weekend busting some pretty cringe-worthy moves. It’s like a fist bump mixed with nerdy side shuffling and Taekwondo. The Leo Bump and Shuffle Sucker Punch? The man’s got the hat over his eyes, drink in hand (God knows what he was sipping on to induce this craziness), and that awful beard goatee thing on his face. In any case, TMZ caught some of it on video, and Getty got high-res photos of the mess, which I made a lovely infinite loop GIF out of for your viewing pleasure. Somebody get Leo a professional dance partner. Stat. And a barber for that beard too, please.